UPDATE: WordPress Exploit Framework v1.6.1! Wow I seem to have missed a lot of updates lately. This time, I missed an update about WPXF. We now have the WordPress Exploit Framework v1.6.1 amongst us! This new version among other things updates a major bug that occurred while updating the framework and adds multiple new modules and payloads! Read more about UPDATE: WordPress Exploit Framework v1.6.1! PowerSAP: A PowerShell SAP Security Assessment Tool! This post is about PowerSAP, a tool that was included in this years BlackHat Arsenal. What I like about this tool is that it does not try to re-invent the wheel and yet keeps it's source code open for all of us to see and understand. The author @_Sn0rkY is upfront about this and mentions this in the tool description itself. Read more about PowerSAP: A PowerShell SAP Security Assessment Tool! JexBoss: Java Deserialization Verification & EXploitation Tool! I was working with a customers Red Hat JBoss server today and wanted to test for affected deserialization vulnerabilities. Though my favourite go-to tool - the Burp Suite has many extensions, I wanted to try something that I had not before. That's when I stumbled across JexBoss, which turned out to be a pretty decent open source tool. I think JexBoss is a play on Java Read more about JexBoss: Java Deserialization Verification & EXploitation Tool! 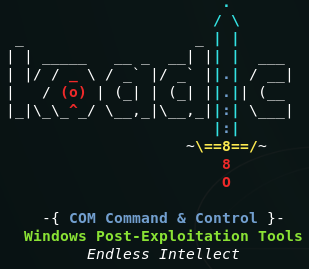 Koadic: An Advanced Windows JScript/VBScript RAT! All of us know that post-exploitation we need some mechanism to maintain access on the target. One of the most common methods is by installing a trojan. I have tried to maintain a list of similar tools on the malware sources page on this blog. Now, there is a new entrant which ups the game real time - Koadic. It also happens to be open source and as much difficult to detect by Read more about Koadic: An Advanced Windows JScript/VBScript RAT! This is a short post about nps_payload, an open source, python script that helps you create basic payloads that help you avoid or bypass intrusion detection systems. This is a mix of @ben0xa's Not PowerShell (nps) frameworks and some features of @HackingDave’s unicorn tool. As you know, Unicorn is a simple tool for using a PowerShell downgrade attack and inject shellcode Read more about nps_payload: Basic Intrusion Detection Avoidance Payload Generator!